The Australian Reinsurance Pool Corporation (ARPC) is a corporate Commonwealth entity established by the Terrorism Insurance Act 2003 (TI Act) to administer the terrorism reinsurance scheme. The scheme provides primary insurers with reinsurance for commercial property and associated business interruption losses arising from a declared terrorist incident. The TI Act was established following the withdrawal of terrorism insurance cover by the private insurance market after the 11 September 2001 terrorist attacks in the United States. The government was concerned that the lack of comprehensive insurance cover for commercial property or infrastructure would lead to a reduction in financing and investment in the Australian property sector. The TI Act overrides terrorism exclusion clauses in eligible insurance contracts, enabling coverage of eligible terrorism losses arising from a declared terrorist incident. The Minister is required to officially announce a declared terrorist incident before the provisions within the TI Act can be triggered. The TI Act requires a review to be conducted at least once every three years that examines the need for the Act to continue in operation. Through the scheme, insurance companies can choose to reinsure the risk of claims for eligible terrorism losses by electing to purchase terrorism reinsurance from ARPC. Consequently, holders of eligible insurance contracts will be covered in the event of a declared terrorist incident, with insurers required to meet these claims in accordance with the other terms and conditions of individual policies. Claims against the scheme are paid once an individual insurance company’s total claims exceed its risk retention. ARPC’s pool of retained earnings will meet claims until the agreed retrocession deductible is reached. At this point claims are funded by the retrocession program. Once retrocession is exhausted, claims will continue to be met by the Commonwealth guarantee. The total capacity of the scheme is over $13.4 billion. If the responsible Minister considers that the amount paid of payable under the Commonwealth guarantee will exceed $10 billion, the Minister must also announce a reduction percentage. This will have the effect of limiting the level of cover, by reducing the amount payable by the insurer to the policy holder. 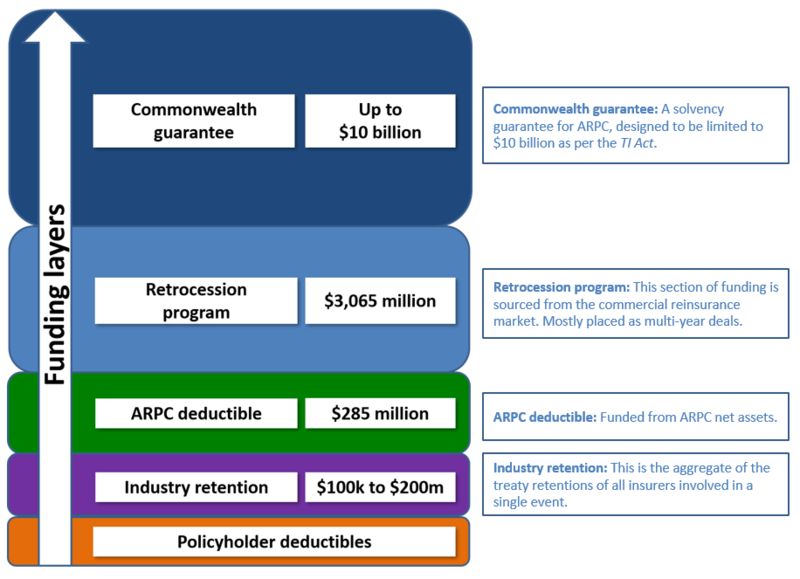 ARPC purchases retrocession capacity to protect the Commonwealth guarantee against small to medium sized losses. The retrocession program also encourages private market participation by Australian and global reinsurers to cover private commercial business assets on Australian soil. Reinsurance premiums charged by ARPC vary by location and are listed as 2.6 per cent of the premium for eligible policies in Tier C (mostly rural areas), 5.3 per cent of premium in Tier B (mostly suburban areas) and 16 per cent of premium in Tier A (major city CBD). Eligible property includes: commercial and industrial buildings, mixed-use buildings with a floor space of at least 20% used for commercial purposes, and high-value buildings with a sum insured of at least $50 million, whether used for commercial or other purposes. Coverage includes fixtures, the contents within those buildings and associated business interruption. Eligible property also includes commercially owned infrastructure such as roads, tunnels, dams, railways and pipelines as well as sites covered by a construction policy. Farms can also obtain cover if they hold insurance against business interruption. An eligible terrorism loss does not include a loss or liability arising from hazardous properties of nuclear fuel, material or waste. The Scheme also covers declared acts of terrorism described as “chemical”, “biological”, “polluting”, “contaminating”, “pathogenic”, “poisoning”, or words of similar effect.